This is a Kaiser Health News story. With Democrats now in control of the U.S. House of Representatives, it might appear that the fight over abortion rights has become a standoff. After all, abortion-rights supporters within the Democratic caucus will be in a position to block the kind of curbs that Republicans advanced over the past two years when they had control of Congress. But those on both sides of the debate insist that won’t be the case. Despite the Republicans’ loss of the House, anti-abortion forces gained one of their most sought-after victories in decades with the confirmation of Justice Brett Kavanaugh to the Supreme Court. Now, with a stronger possibility of a 5-4 majority in favor of more restrictions on abortion, anti-abortion groups are eager to get test cases to the high court. 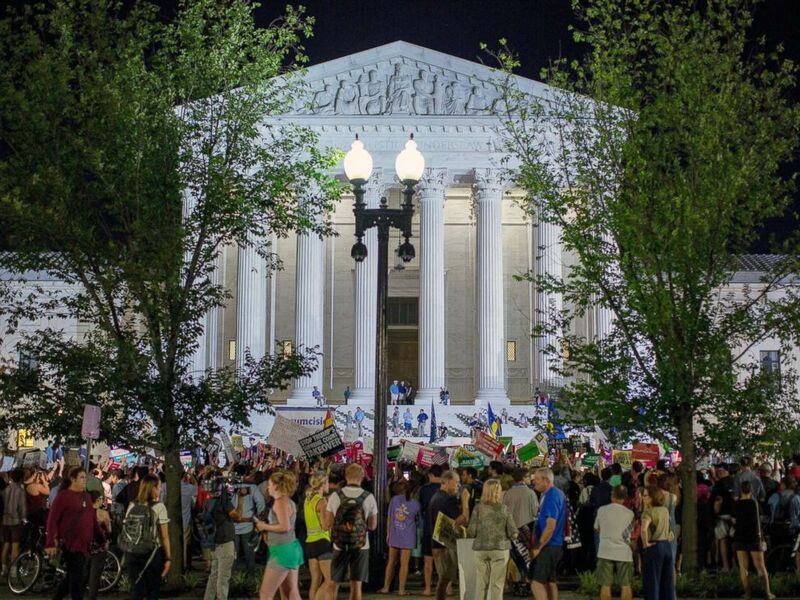 Protesters demonstrate in front of the Supreme Court, July 9, 2018, in Washington, D.C. The Republican majority in the U.S. Senate is expected to continue to fill the lower federal courts with judges who have been vetted by anti-abortion groups. Abortion-rights supporters think they, too, can make strides in 2019. “We expect 25 states to push policies that will expand or protect abortion access,” said Dr. Leana Wen, who took over as president of the Planned Parenthood Federation of America in November. If the landmark 1973 Supreme Court decision Roe v. Wade is eventually overturned, states will decide whether abortion will be legal, and under what circumstances. The Republican-controlled Congress proved unable in 2017 or 2018 to realize one of the anti-abortion movement’s biggest goals: evicting Planned Parenthood from Medicaid, the federal-state health insurance program for people who have low incomes. Abortion opponents don’t want Planned Parenthood to get federal funds because, in many states, it functions as an abortion provider (albeit with non-federal resources). Though Republicans have a slightly larger majority in the new Senate, that majority will still be well short of the 60 votes needed to block any Democratic filibuster. Because Democrats generally support Planned Parenthood, the power shift in the House makes the chances for defunding the organization even slimmer, much to the dismay of abortion opponents. “We’re pretty disappointed that, despite having a Republican Congress for two years, Planned Parenthood wasn’t defunded,” said Kristan Hawkins of the anti-abortion group Students for Life of America. “This was one of President Trump’s promises to the pro-life community, and he should have demanded it,” she added. Another likely area of dispute will be the future of various anti-abortion restrictions that are routinely part of annual spending bills. These include the so-called Hyde Amendment, which bans most federal abortion funding in Medicaid and other health programs in the Department of Health and Human Services. Also disputed: restrictions on grants to international groups that support abortion rights, and limits on abortion in federal prisons and in the military. However, now that they have a substantial majority in the House, “Democrats are on stronger grounds to demand and expect clean appropriations bills,” without many of those riders, said Wen of Planned Parenthood. While Senate Republicans are likely to eventually add those restrictions back, “they will have to go through the amendment process,” she said. And that could bring added attention to the issues. With control of House committees, Democrats can also set agendas, hold hearings and call witnesses to talk about issues they want to promote. “Even if the bills don’t come to fruition, putting these bills in the spotlight, forcing lawmakers to go on the record — that has value,” said Wen. While Congress is unlikely to agree on reproductive health legislation in the coming two years, the Trump administration is still pursuing an aggressive anti-abortion agenda — using its power of regulation. A final rule is expected any day that would cut off a significant part of Planned Parenthood’s federal funding — not from Medicaid but from the Title X Family Planning Program. Planned Parenthood annually provides family planning and other health services that don’t involve abortion to about 40 percent of the program’s 4 million patients. The administration proposal, unveiled last May, would effectively require Planned Parenthood to physically separate facilities that perform abortions from those that provide federally funded services, and would bar abortion referrals for women who have unintended pregnancies. Planned Parenthood has said it is likely to sue over the new rules when they are finalized. The Supreme Court upheld in 1991 a similar set of restrictions that were never implemented. Abortion opponents are also pressing to end federal funding for any research that uses tissue from aborted fetuses — a type of research that was authorized by Congress in the early 1990s. “It’s very important we get to a point of banning” fetal tissue research “and pursuing aggressively ethical alternatives,” said Dannenfelser. Abortion opponents having pushed through more than 400 separate abortion restrictions on the state level since 2010, according to the Guttmacher Institute, an abortion-rights think tank. In 2018 alone, according to Guttmacher, 15 states adopted 27 new limits on abortion and family planning. But 2018 also marked a turning point. It was the first time in years that the number of state actions supporting abortion rights outnumbered the restrictions. For example, Massachusetts approved a measure to repeal a pre-Roe ban on abortion that would take effect if Roe were overturned. Washington state passed a law to require abortion coverage in insurance plans that offer maternity coverage. The fate of all these policies will be decided eventually by the courts. In fact, several state-level restrictions are already in the pipeline to the Supreme Court and could serve as a vehicle to curtail or overturn Roe v. Wade. Among the state laws closest to triggering such a review is an Indiana law banning abortion for gender selection or genetic flaws, among other things. Also awaiting final legal say is an Alabama law banning the most common second-trimester abortion method — dilation and evacuation. KHN’s coverage of women’s health care issues is supported in part by The David and Lucile Packard Foundation.